Wälischmiller Engineering supplies remote handling solutions for applications in the nuclear power and petrochemical industries. Wälischmiller’s handling systems offer various remote master-slave manipulators from the A100 and A200 series, remote-controlled power manipulators from the A1000 series for lifting heavy loads, and the robotic system TELBOT®. In difficult and challenging environments, Wälischmiller provides solutions for many high-radiation remediation challenges, especially onshore and offshore explosive (ATEX directive) conditions. The TELBOT robot was originally designed for and is widely used in the nuclear industry. In 2012, Wälischmiller Engineering was approached to deliver a TELBOT to be used for the first time for vessel inspection in the petrochemical industry at the Nyhamna Refinery under non-ATEX conditions. Due to this successful implementation, Wälischmiller Engineering was involved in a project to be the first company worldwide to ever design and manufacture an ATEX Zone 0 certified robot for pressure vessel cleaning and inspection. 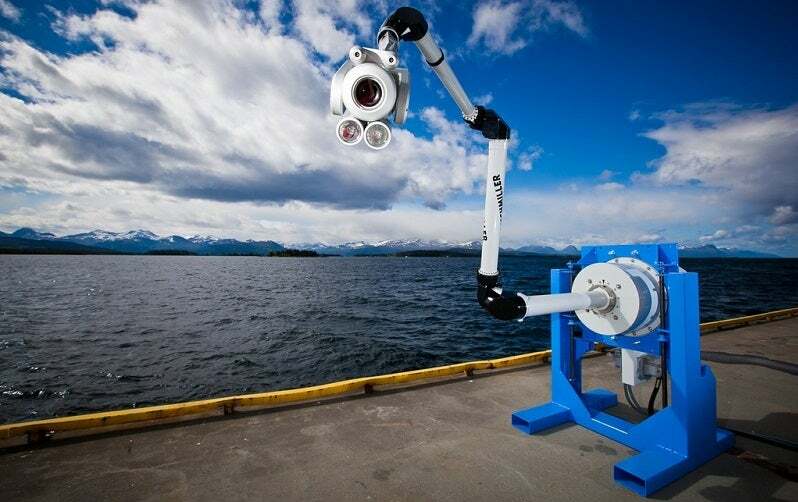 Developed and manufactured as part of the Demo 2000 project of the Norwegian Ministry of Petroleum and Energy in cooperation with the consortium members Shell Norway, Statoil, Gassco and Prezioso Linjebygg, the TELBOT is an ATEX Zone 0, Category 1 certified robotic system. The goal is to clean and inspect pressure vessels used in the petrochemical industry, thus eliminating the need for human entry into those vessels, resulting in a vast reduction of work related health and safety risks, as well as in downtime of the vessel itself, which can greatly reduce costs during turnarounds. For Demo 2000, the specifications were decided by the consortium members who agreed on an arm with eight robotic axes plus two axes inside the tooling unit with an overall reach of 6,685mm. As a result of the TELBOT joint design, the robotic arm is able to reach, clean and inspect all areas inside suitable vessels. An innovative 3D path planning tool is used to preplan the whole cleaning and inspection process as well as manually deviating from the preplanned course if the need arises, while always maintaining an active collision avoidance system that will stop the TELBOT automatically if needed. This enables the service providers to complete most of the preparation work before the turnaround on site therefore further mitigating risk from the critical path. Wälischmiller offers unique simulation software to investigate the possibility of using a TELBOT system for a special vessel. An innovative software for robotic inspection of petrochemical vessels, it enables service providers to easily check the capabilities of a robotic system. Pre-planning cleaning and inspection before entering a vessel requires additional safety, precision and comparability. Creating a unique control system, the software significantly reduces shut-down time, errors and risk, while creating a more precise cleaning and inspection schedule. The company’s software offers a unique path creation method, including semi-autonomous planning, which leads to efficient and easy planning of deployment. Carr's Group is pleased to announce it has completed the full acquisition of US-based NuVision Engineering's holding firm ESI Holding Company Inc.
Wälischmiller Engineering's partner WAK GmBH recently enlisted the company's assistance in the dismantling and decommissioning of the Karlsruhe Reprocessing Plant.